Vesti claimed that Butkevych callously encouraged mass murders in Donetsk and Lugansk regions of Ukraine. Vzglyad followed suit, using the same video. Not to be outdone, Komsomolskaya Pravda went an extra mile, pulling a screenshot from an entirely different video to create the false impression that Bogdan Butkevych made a Nazi hand gesture salute. They drew parallels to the 1930’s Germany, stating that Butkevych proposed that the people of Donbass be dealt with in the barbaric way. Russian television program “Time” on Channel One did its best to draw the same parallels. Channel One mused about the latest developments in the Ukrainian Parliament (Verkhovna Rada), then unsuccessfully attempted to solicit commentary from MP Oleg Lyashko, who said he would be interviewed only by real journalists and not Goebbels-type propagandists. The very next cut showcased Bogdan Butkevych, introduced by Channel One as a “Kyiv journalist and a Nazi.” Channel One also expressed its shock about the host not interrupting his alleged “fascist” call to genocide. In fact, such a statement would be considered extremely offensive – if only it was real. It was re-cut, edited to create a false impression as to what Butkevych actually said. 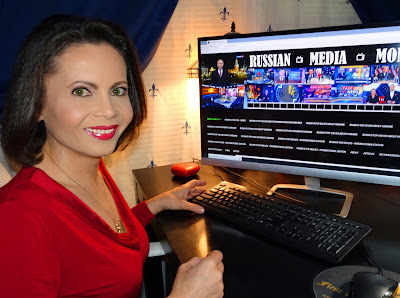 The fact that the video in question was crudely spliced together won’t come as a surprise to anyone who’s been following the barrage of fake news, reported by Russia’s government-funded mainstream media. Kremlin’s massive propaganda apparatus doesn’t think twice before reporting made-up stories about crucified babies and corpses that rise up to go into battle. 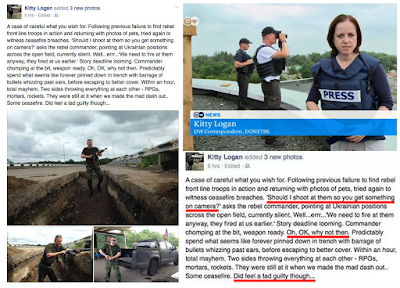 Russian agitprop does not shy away from using photos and video of Russia’s own atrocities in news reports about current events in Ukraine.